Ms. Naghipour studied law at the university of Heidelberg, in Bangalore (India) and in Köln. She also successfully completed a language training in French law at the university of Heidelberg. Subsequently, she worked in the public relations department of the German Bundestag (parliament), wrote for the Missy Magazine and offered legal advice for refugees at Amnesty International. Therefore, she has a lot of experience in the field of asylum law and the right of residence. During her legal clerkship, she worked at the headquarters of the Federal Foreign office (Auswärtiges Amt) and the Permanent Representation of Germany to the United Nations in New York as well as in a law firm for aliens law with the focus on the right of residence. 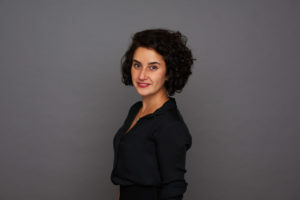 Furthermore, Ms. Naghipour worked as a freelancing interpreter for Farsi, Dari and French at the Federal Office for Migration and Refugees and for Youth Welfare Offices and shelters for refugees around Germany . At the moment, she is working on her doctorate in constitutional law. She also is a founding member and chairwoman of the regional group Berlin for “Anwältinnen ohne Grenzen e.V. ” (lawyers without borders) and deputy chairwoman of the association “DeutschPlus” (GermanPlus), an initiative for a pluralistic republic. Ms. Naghipour is a registered attorney at the bar association of Berlin and consults in the languages German, English, Farsi/Dari and French. Since 2017, she is employed at the law firm Abokal.